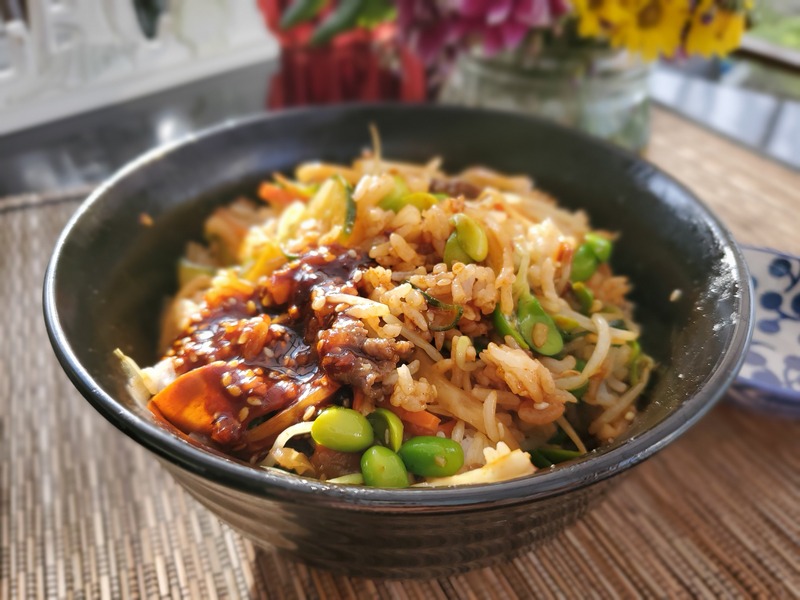 This is another of those yummy dishes that I tried at Genwa in Los Angeles. I spent the whole morning preparing the banchan (side dishes) and bulgogi. The rest is just an assembly cexercise. It took much longer than I wanted, but I really enjoyed this colorful and healthy meal. Prepare cucumber. Add 1 tsp of salt to the cucumber, stir until salt is well distributed. Let the cucumber sit on the counter for at least 30 minutes to draw out the water. 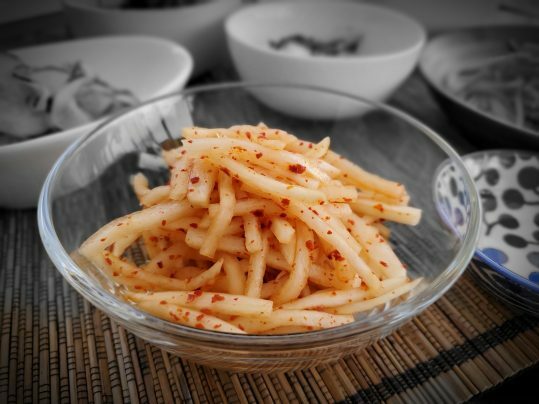 Prepare other side dishes in the mean time. Prepare daikon. 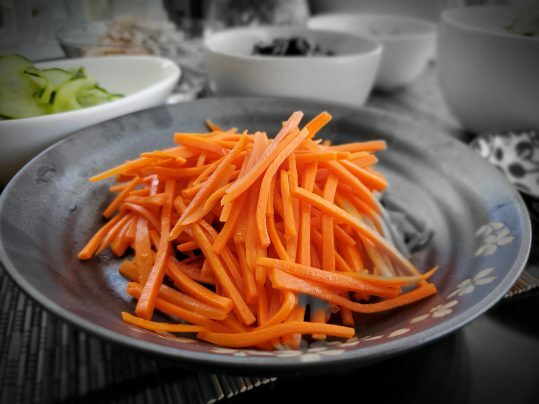 Add seasoning to the daikon. Stir until well combined. Refrigerate for at least 30 minutes. Prepare spinach. Bring 6 cups of water and 1 tsp sea salt to a boil. Add spinach and cook for 30 seconds. 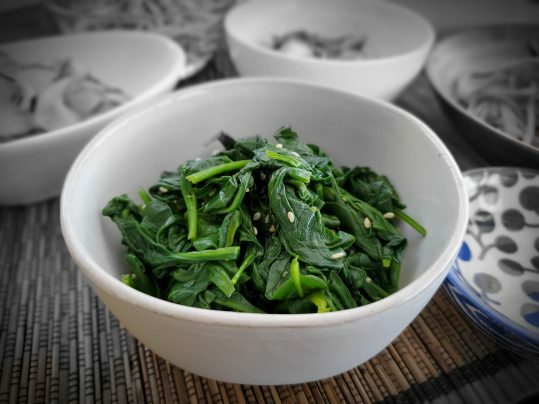 Drain and squeeze the spinach of excess water. Stir in the seasoning until well combined. Transfer to a bowl. Set aside. 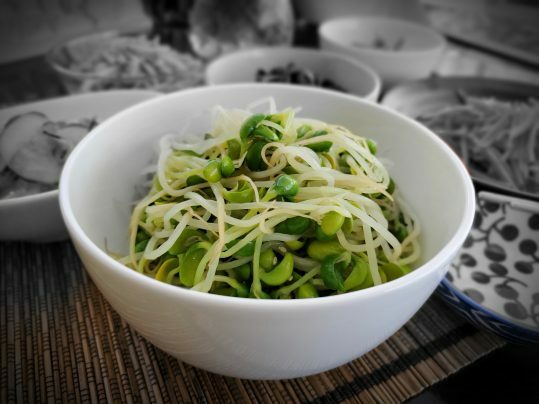 Prepare soy-bean sprouts in the same way as the spinach. Set aside when cooked. Prepare carrots. Heat 1 Tbsp sesame oil in a skillet over medium-high heat. Add julienned carrots and sprinkle sea salt over it. Cook for 2 minutes. Transfer to a bowl. Set aside. 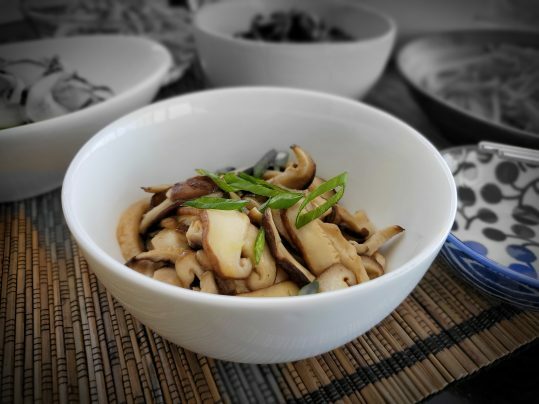 Prepare shiitake mushrooms in the same way as the carrots. Set aside when cooked. 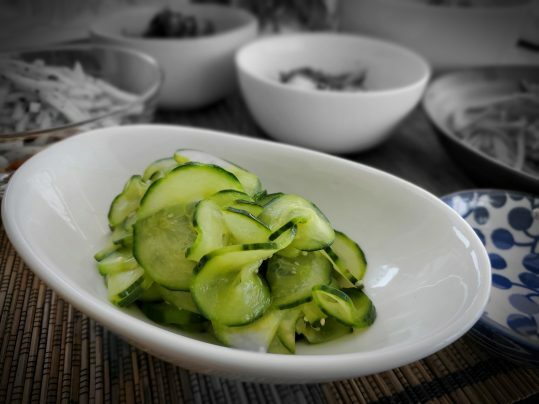 Continue with preparation of sliced cucumber. Squeeze the cucumber of excess water. Heat 1 Tbsp of cooking oil in the skillet over medium-high heat. Add the cucumber slices. Toss for 30 seconds. Add the sesame oil and sesame seeds. Toss for another 30 seconds. Transfer to a bowl. Set aside. 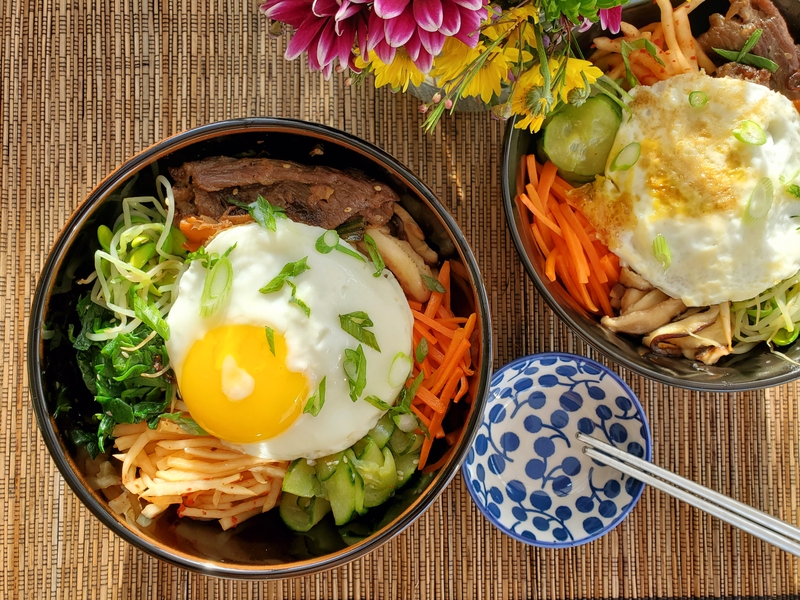 Cook bulgogi over the skillet. Set aside. 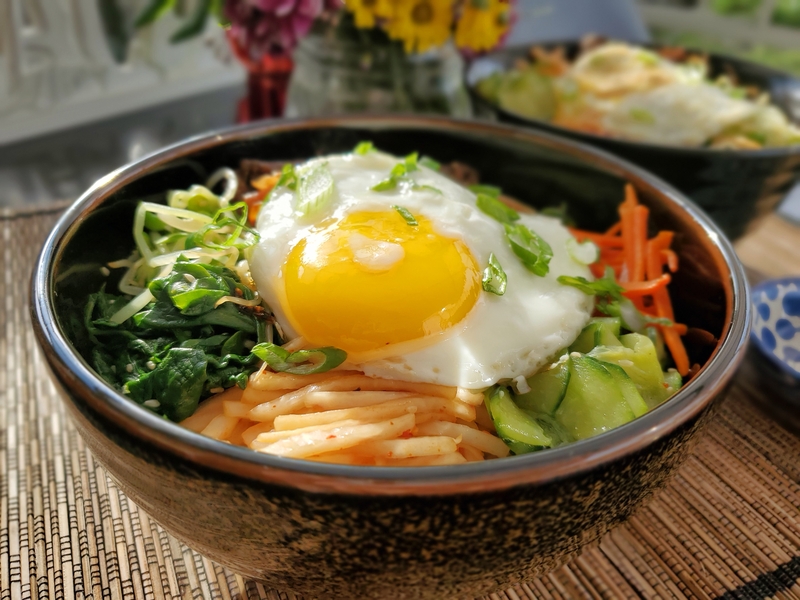 Combine bibimbap sauce in a small bowl. Pan fry both eggs, sunny-side up. Heat 1 Tbsp sesame oil over medium-high heat in a skillet. Add one cup of cooked rice and distribute evenly to cover the bottom of the skillet. Cook until the bottom is golden and crispy. Remove from heat. Divide the crisped rice in two serving bowls. Add desired amount of freshly cooked jasmine rice over the crispy rice in each bowl. 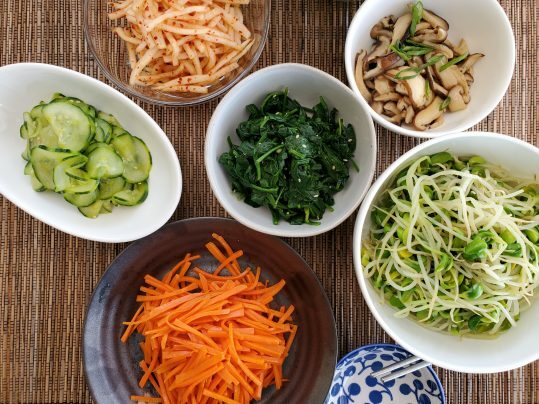 Layer with the banchan and bulbogi. Lastly top it with a sunny-side up egg.